Experience a beautifully remodeled Lodge with several different options to please every guest. Each room is loaded with amenities including fridge, microwave, desk, WIFI and flat screen TVs. Room choices vary from two queen beds, a king bed with sofa sleeper, a king two-room suite and king fireplace whirlpool suites. There is a wonderful hot breakfast each morning, with an amazing coffee bar in the lobby. Be greeted at check in by a weekday managers reception. Seasonal treats may include hot soup, fresh cookies and a meat and cheese platter. Our staff has gone out of their way to offer true Minnesota hospitality. Please check out our pool, whirlpool, fitness center and game room available for everyone. If business is your venture, accomplish all your work in our business center located in the lobby. 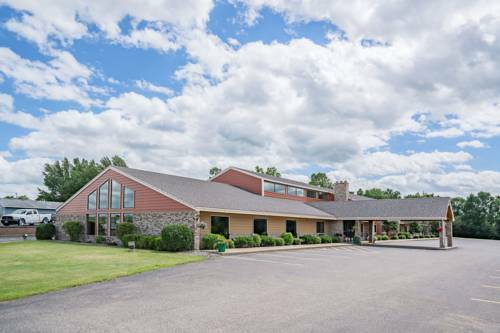 The AmericInn is located within minutes of several businesses including Essentia Health, Lakeshirts, and BTD. If play is why youre here to stay, we are conveniently located within minutes of downtown shopping and the mile long beach. Beautiful Hotel located of main highway close to city business and tourist attractions. Hotel is located within minutes of downtown shopping, several restaurants, and nightly entertainment. With 412 lakes located in 25 miles of Detroit Lakes, there are plenty of nature activities to enjoy. Heartland bike trail runs thru town, and hotel is located off of major snowmobile trail. Train station and small air port located within minutes of hotel. The strangest giant bird statue that we've seen, a 13-foot-tall creature posed as if ready to peck to death nervous admirers. ~31 miles from Detroit Lakes. ~40 miles from Detroit Lakes.